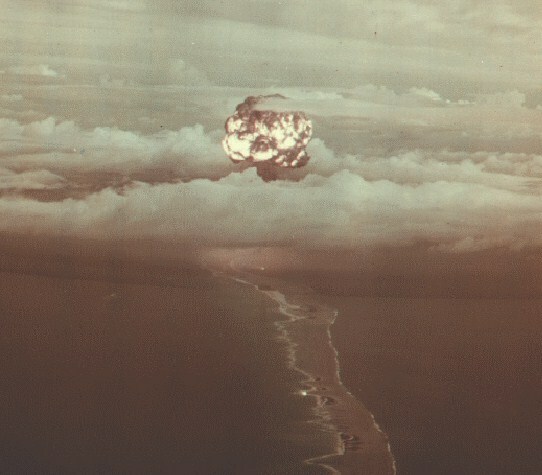 The Greenhouse Test Series was conducted at Enewetok Atoll in April and May of 1951. It consisted of four relatively high yield tests (by the standards of the time) - Dog, Easy , George, and Item. Dog and Easy were proof tests of two new strategic bombs the Mk 6 and Mk 5 respectively. George and Item were the first true tests of thermonuclear fusion - the release of fusion energy from thermally excited nuclei. George was a research experiment that studied deuterium-fusion burning when heated by thermal radiation. Item was the first test of the principle of fusion boosting of fission devices. 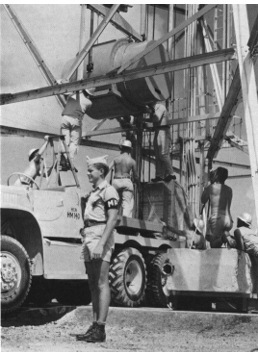 Below is an inert duplicate of the Dog device being loaded on the test tower. Dummy devices, that were physically and electrically identical, were used routinely to test and verify the shot set-up prior to installing the actual test device. Dog was a proof test of Mk 6 strategic bomb. This was the highest yield test up to that time (superseded by George a month later), and evaluated the stockpiled MK 6 weapon with a "How Double Prime" composite uranium-plutonium core. The explosion lifted 250,000 tons of soil to an altitude of approximately 35,000 feet. The Mk 6 was a improved large "Fat Man-style" weapon, with a 60 inch diameter, a length of 128 inches, and a weight of 8500 lb (later reduced to 7600 lb) a reduction from the earlier 10900 lb Mk 4. The Mk 6 had an improved 60 point implosion system (the Mk 4 had a 32 point system) that provided greater compression and higher efficiency. 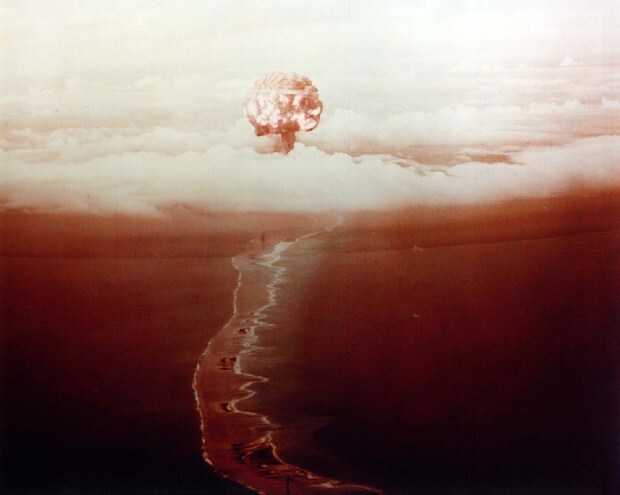 The Mk 6 was the first nuclear weapon stockpiled in large numbers by the U.S. (over 1000 eventually produced). Stockpiling of the MK 6 on an emergency basis was underway at the time of the test. 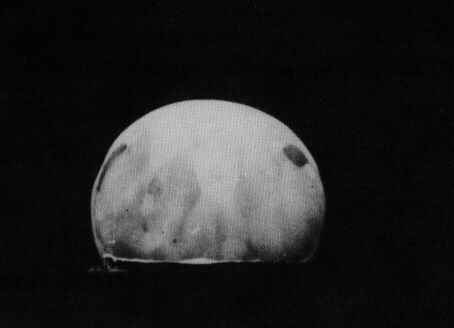 Proof test of the TX-5D bomb, a major advance in weight reduction for implosion bombs. Weight was 2700 lb with a 40 inch diameter, compared to 10,000 lb and a 60 inch diameter for earlier designs. Used a 92 point (lens) implosion system and a composite (plutonium/oralloy) core. 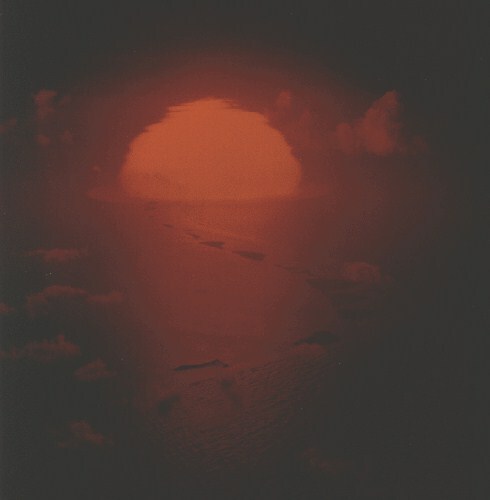 This design was used as the primary in the first thermonuclear bomb test, Ivy Mike. This test was also used to test weapon effects on various military structures. These structures were erected on Enjebi and nearby Mijakadrek Island. 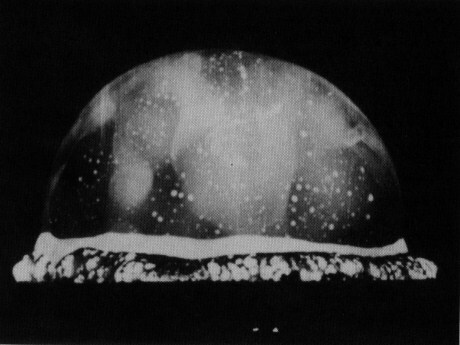 George was the largest nuclear explosion to date (a record that stood until the first thermonuclear device test, Ivy Mike, 17 months later). George was a thermonuclear physics experiment, and used a purely experimental device design unsuitable for use as a weapon. The test device, named the CYLINDER, consisted of an enriched uranium core which was imploded using a unique cylindrical implosion system. This device may have been the first to use external initiation to begin the fission chain reaction. The device was a disk about 8 ft across and 2 feet thick perforated by an axial hole. The hole, compressed to a narrow channel by the implosion, conducted thermal radiation to a small beryllium oxide chamber containing several grams of cryogenic deuterim-tritium mixture. The thermal radiation not only heated the fuel chamber to fusion temperatures, the pressure in the BeO wall caused it to implode and compress the fusion fuel, accelerating its combustion. 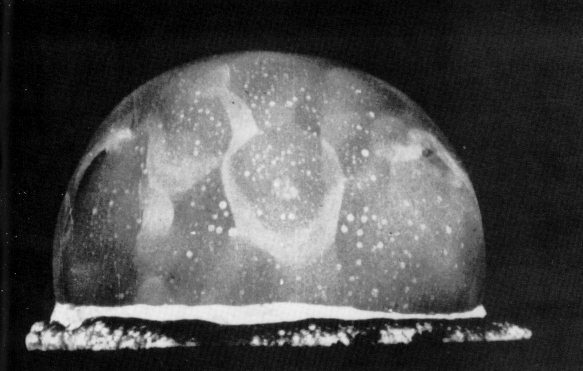 The thermal radiation arrived ahead of the shock front of the fission explosion, allowing time for a reaction to occur before being engulfed by the expanding fission fireball. The yield of the fusion reaction was negligible compared to the fission device. 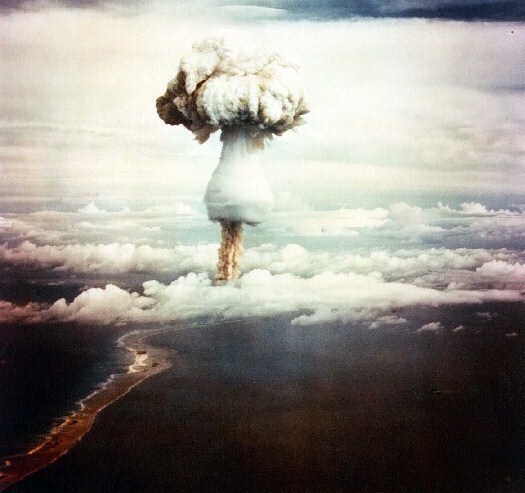 The thermonuclear portion of the experiment was largely developed by Edward Teller, the Cylinder may have been based on a design by physicist George Gamow. The progress of the fusion burn was observed by measuring the thermal X-rays emitted by the fusion plasma. This required instruments that were shielded from the thermal X-rays and the gamma rays of the fission bomb, and were far enough away from the explosion to be able to measure and transmit data while the fusion burn was in progress. This part of the experiment was designed by Hugh Bradner and Hebert York. The measurements were made by recording the fluorescence of a set of K-edge filters located at the base of the shot tower. X-rays from the fusion chamber reached the instruments through vacuum filled pipes that were inside a 4 ft. diameter lead pipe that blocked out extraneous X-rays and gammas, and weighed 235 tons. The total weight of diagnostic equipment was 283 tons. 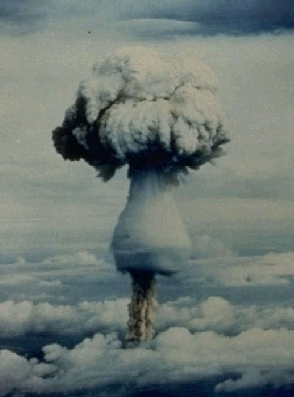 The test was originally planned to study the ignition concept for the "Classical Super" thermonuclear weapon design (which had already been shown to be infeasible). 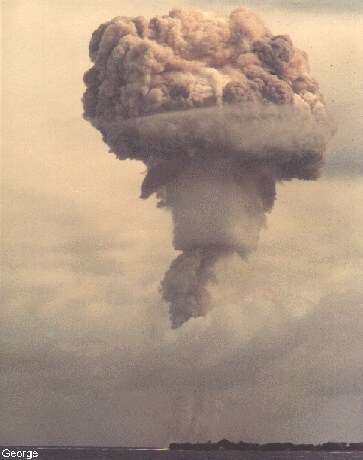 The test fortuitously provided useful data on radiation implosion, an essential element of the Teller-Ulam design which had been devised just two months prior. George left a large shallow crater in the coral and sand atoll - 1140 feet across and 10 feet deep (such wide shallow craters were typical of atoll tower shots). In the sequence of three Rapatronic camera pictures below the development of the "Mach stem" can be seen as the fireball shock wave reflects off the ground. The Mach stem is a belt of intensified shock pressure at the base of the shock front. Since in this phase of growth the temperature (and hence brightness) of the fireball is determined by the strength of the shock wave, a bright band can be seen where the Mach stem is located. First test of the principle of "fusion boosting", the use of a thermonuclear fusion reaction to inject neutrons into a fission core to boost efficiency. The Item device used a cryogenic deuterium-tritium mixture inside an enriched uranium core. The boosting approximately doubled the yield over its expected unboosted value.